In addition to the concessions granted to the tourism industry through Budget 2018, the Ministry of Tourism Development has made other specific requests to the Minister of Finance. These requests include reverting to the previous excise licensing hours, credit facilities for the trade and other concessions. 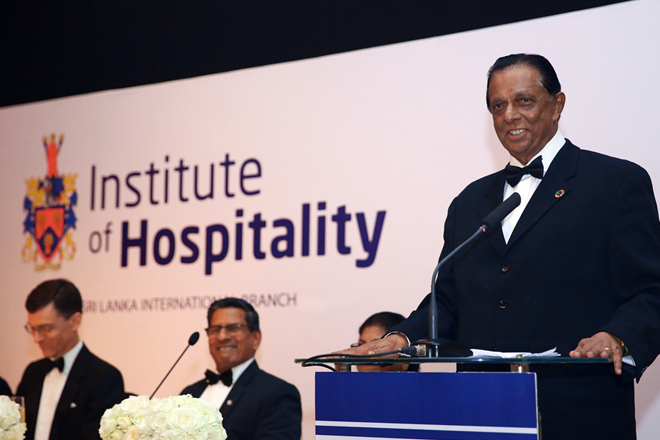 This was revealed by Minister of Tourism Development and Christian Religious Affairs, John Amaratunga during his address at the Institute of Hospitality Sri Lanka Branch 19th Chairman’s Black Tie Dinner on November 29th at the Colombo Hilton. While Minister Amaratunga was the Guest of Honour, British High Commissioner in Sri Lanka, James Dauris was the Chief Guest at the gala event. The Minister spoke at length about the many challenges the industry has faced this year and the resultant slowdown in arrival figures. “At the very start of the year we faced the challenge of the partial airport closure which went on for four months. This was followed by devastating floods in the southern half of the country followed by the dengue epidemic which resulted in many countries issuing travel advisories. All this took its toll on the arrival figures this year. We will most likely see the same number of arrivals as last year,” he said. The Minister was also optimistic about the year ahead. “After much effort we are finally seeing progress in the global marketing campaign which as the industry keeps pointing out, is long overdue. One of the issues we have had is the stringent checks and balances with regard to finance and the fact that officials don’t want to take a chance given past experience. These are practical issues that have delayed the global campaign. However the digital campaign is now ready to be implemented early next year,” the Minister explained. Focusing on another challenge, Minister Amaratunga highlighted the need for skills development and proper training for hospitality industry personnel. “It is no secret that we are facing a shortage of skilled personnel for the hospitality industry. An organisation such as the Institute of Hospitality is in a unique position to help us overcome this problem by leveraging its experience and know-how acquired through 78 years of existence and a branch network spanning over 100 countries,” he said. Minister Amaratunga called on the institution to actively contribute to the national training efforts undertaken by tourism stakeholders. “I’m aware that this is already taking place but these efforts must be extended beyond the periphery and directed towards attracting the youth in rural areas who may otherwise be lost to the industry,” he said. The Institute of Hospitality is a professional body for managers and aspiring managers working and studying in the hospitality, leisure and tourism industries. It has been playing an important role in Sri Lanka’s tourism landscape since the early ‘90s. Established in the 1930s in the UK, today the Institute of Hospitality has grown in to a global authority in the hospitality business and continues to play a leading role in Sri Lanka’s evolving tourism industry. British High Commissioner James Dauris and Chairman of the Institute of Hospitality Sri Lanka Branch, Thusith Samarawickrema also spoke during the event.